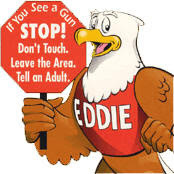 The City of Palm Coast Parks and Rec is teaming up with the Flagler County Sheriff's Office to host the Eddie Eagle GunSafe Program. This is a FREE gun accident prevention program. The classes will be taught by a certified NRA instructor and law enforcement will be in attendance. No actual firearms will be used in the program. This is a parent with child program. Pre-register by clicking HERE.